Frank Saliani is a ceramic artist. He focuses on creating pieces which are functional, comfortable, and which naturally find a place in the lives of their owners. 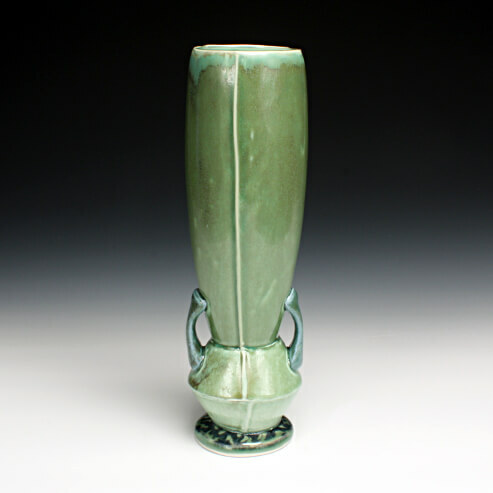 Frank studied ceramics at Syracuse University and received an M.F.A. from Ohio University. He completed residencies at the Carbondale Clay Center, the Arrowmont School of Arts and Crafts, Millersville University, and the Red Lodge Clay Center. Central to my work is the idea that the whole is greater than the sum of its parts. Everything in our world is built of smaller pieces. Not just the tangible objects in our lives, but the experiences, relationships, and the ideas that make us who we are. My work explores the larger relationships and patterns that occur through the interaction of smaller parts. Forms are cast from three sets of colored clay slips: blue, yellow and green. The number of forms, along with variation of color, allows for a finite yet immense number of possibilities. Each of the forms I cast can be used in many ways. Using these forms, I create both utilitarian and sculptural work. Utilitarian wares include simple forms like cups and bowls, to larger more complex forms like teapots. My sculptural work explores formal relationships, pattern, and abstraction in ways not bound by the constraints of function. The relationship between the functional and sculptural work provides a tangible example of the connection between the larger themes, patterns, and ideas that make up our lives, and the smaller objects, moments, and actions, that merge to create them.